2 minute takeaway: Enable Canned Responses. 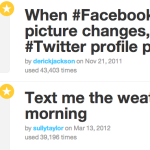 Create Templates for FAQ – Frequently Annoying Questions, or good things you get asked a lot. You know when you feel like you keep getting the same annoying questions asked of you via email? Or have to explain the same thing over and over again? There’s a better way – canned responses! I’ve been using Gmail’s canned responses for years now, so occasionally I forget that it’s hidden over in the silly “Labs” area of our Gmail settings – to be enabled only by those of us curious to venture there. So of course, I share this tip with friends and coworkers often. The first time I helped someone set up canned responses I was blown away by their shrieks of delight. 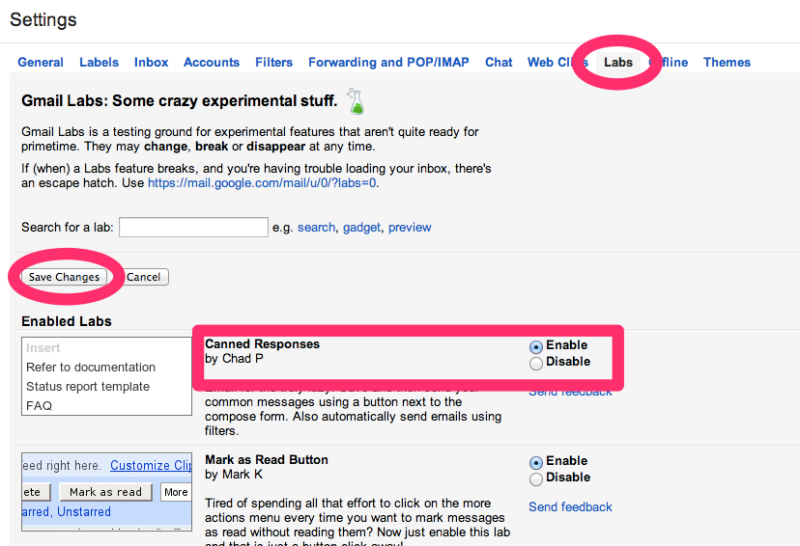 Canned Responses are a Gmail “Lab” feature. Meaning you just need to click on the little gear setting icon, click on the tab that says Labs, and then enable the one that says “Canned Responses” and click “Save”. Before you get all giddy and carried away. Set up one canned response. See how you like it. Wait a day or so while you start thinking about what kind of emails would require canned responses before you spend time creating on ton of responses that you’ll never use. Ready? 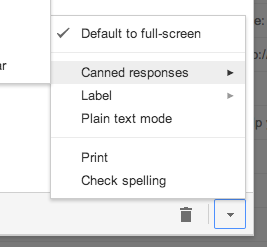 Just click “Compose” or “Reply” to an email and you’ll find the Canned Responses option down by the delete button. As you begin to corral emails of examples that would make good canned responses, you’ll start seeing patterns. Example, if you’re a blogger, you might have a canned response for ad sales requests, one for guest posts, and one for article pitches. #4. Decide which templates are “one and done” and which need to be customized. A canned response simple template should require no customizing. For example, if you run a website and someone asks for your media kit, or if you’re a blogger, when a company asks to do a guest post, which, come on, we all know it’s just an attempt to get a free sponsored post (SEO play!). If the template is structured that you don’t address them by name or reference any specifics, you can quickly insert canned response and send. 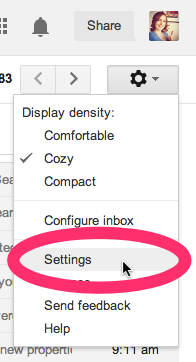 This is a great option for form-type emails sent to you, that clearly weren’t given a ton of thought. You don’t need to waste much time in return, but business can come from things like this, so it may be worth a canned response. 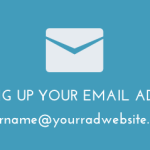 Example: “Thanks for the email, blah blah about how you don’t allow guest posts and sounds like they’re really interested in advertising, link to ad page, sign off”. 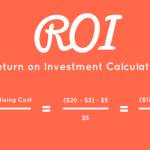 For a more advanced template, think a pitch email or something that you usually customize, a canned response can add in all the stuff that you know you need to cover and then you just have to customize it from there. Also, if you followed the steps in the first post in this series, and structured your inbox correctly, then you should be having these less important emails falling in other tabs or filtering to other areas. So let ’em stack up a little and then have one go at them per day or week. Have you ever accidentally sent a big ol’ mistake in an email. Only realizing it the second you press send. Damn you email, why isn’t there an unsend button. Oh thanks Gmail Labs, there is. This one is especially a life saver when you have Canned Responses. Sometimes we get too efficient for our own good. Now if you hit send too soon, you have a few seconds to click undo instead of just swearing at your screen. Do you have any Canned Responses tips to add? This is Part II in a series on making Gmail do the hard work for you! 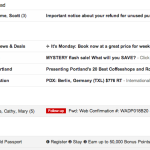 Read Part I – How to Gmail Better and Part III is coming soon!